The opioid epidemic is a serious crisis facing America. But, if we're going to deal with it, we shouldn't over-simplify the story of how it happened. A recent joint investigation by 60 Minutes and the Washington Post pointed mostly to a law enacted in 2016 that diminished the power of the Drug Enforcement Agency as the culprit for the epidemic. It would be comforting if we could reduce the opioid crisis to a simple narrative about bad actors and their innocent victims. But reality is more complex than that. Even policies crafted with the best of intentions in wanting to help and comfort patients can end up causing harm. And in this case, our government’s central planning and over-standardization contributed to the opioid crisis. 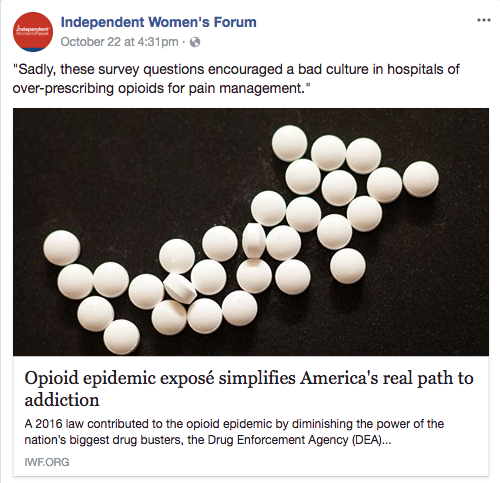 Hadley also addressed some possible solutions to the opioid epidemic in IWF's most recent Policy Focus.